For Domestic Tension, a networked durational performance, Iraqi artist Wafaa Bilal confined himself to a gallery space. He broadcasted over the internet 24/7, inviting viewers to watch and chat with him at all hours. The audience was also given the option of shooting Bilal with a robotically controlled paintball gun. Domestic Tension was one of a number of efforts by Bilal to highlight the violence and racism of US culture after 9/11, and to raise awareness about the suffering that Iraqis have faced for years. Through the performance, he grappled with the trauma of his own experiences under Saddam Hussein’s regime, during the Gulf War attacks, and surviving years of Sunni-Shia brutalities. In addition to foregrounding the lived experience of war, Domestic Tension also engaged with the mediation of violence through digital technology, and the gamification that this allows. 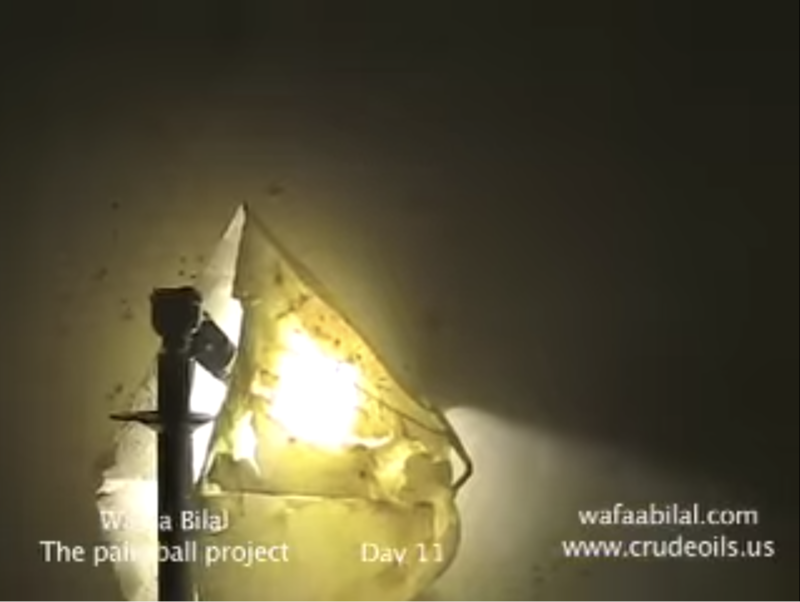 With the click of a mouse, online participants could become soldiers, firing a paintball gun that could cause real (if non-lethal) harm to Bilal. 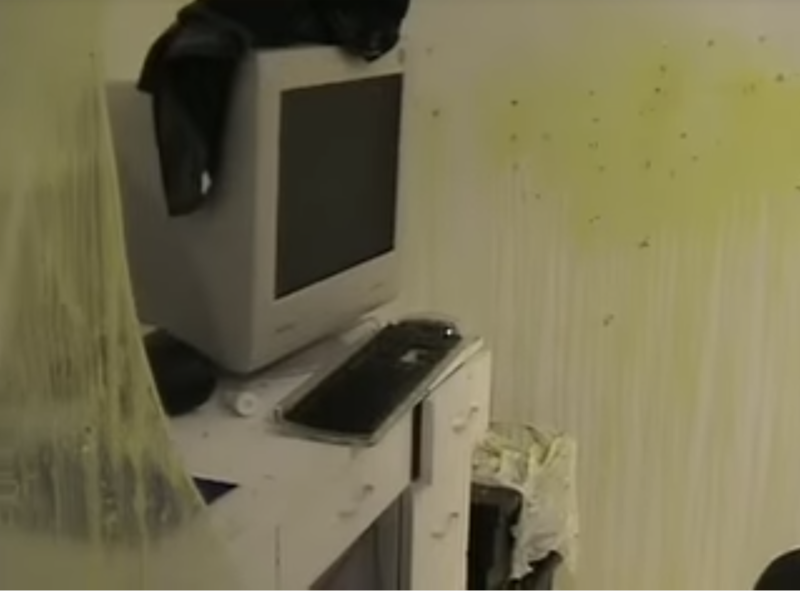 Under the constant line of fire of internet users drawn by the promise of “shooting an Iraqi,” the artist’s living quarters became a war zone for a remote cyber milita, while the chatroom filled with arguments between Bilal’s unseen assailants, and his allies and defenders. In May of 2007, Wafaa Bilal’s solo exhibition “Domestic Tension” opened at Flatfile Gallery in Chicago. He turned a portion of the gallery into a living space, which he would inhabit for the thirty-day run of the show. 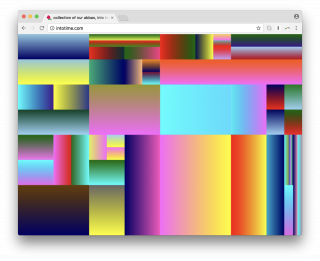 Visitors to the project’s website would see a live view of the space, broadcasting 24/7. They were invited to interact with him and one another via a live chat, and they could choose to remotely aim and fire a paintball gun at the artist. 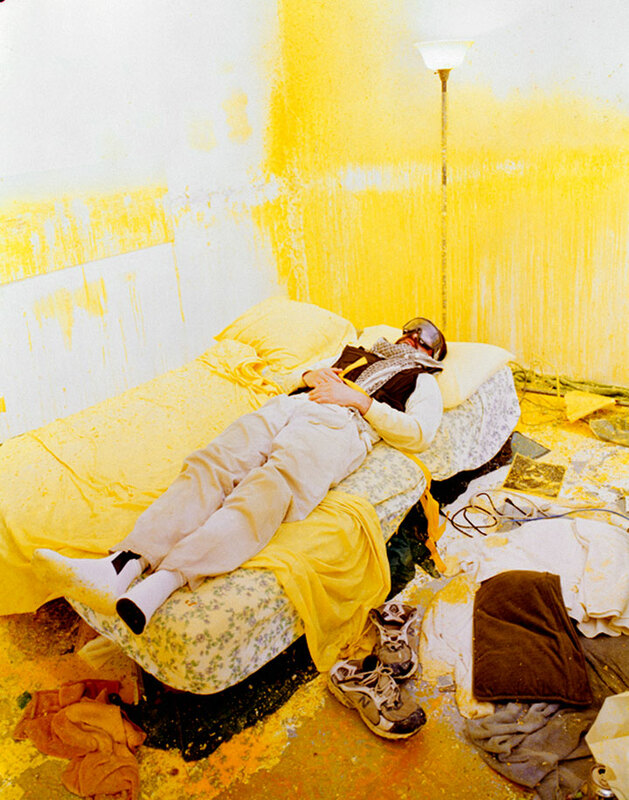 The room held a bed, a lamp, other typical furniture, and a plexiglass screen the artist would try to use as a shield against the paintball bullets. 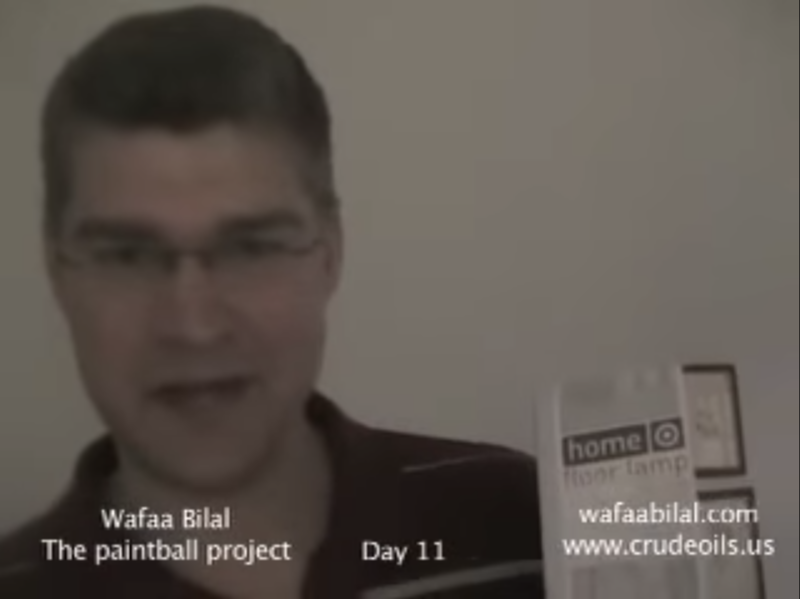 Bilal documented his experience in daily YouTube videos. 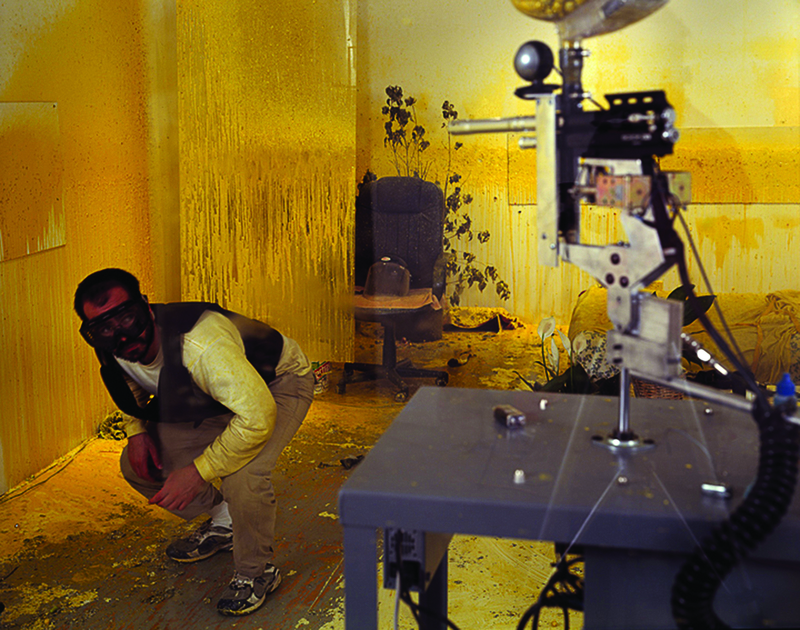 Addressing the camera directly, the artist recorded his fear in the presence of the gun, showed viewers the dripping stains on walls and furniture, addressed the specifics of chatroom conversations, and spoke about his own family and painful past. The project adopted the format of a first-person shooter videogame. Visitors could choose to fire or not, but they could only stand behind the gun, not in the place of the target. Over 65,000 paint pellets were fired at Bilal over the course of the thirty-day exhibition, from more than 136 countries. 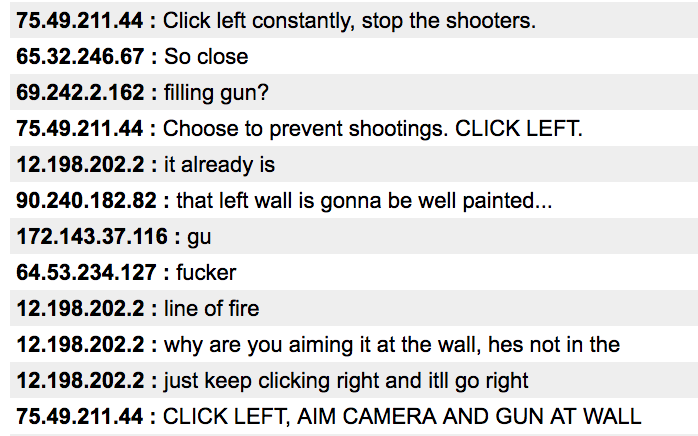 While one user would try to “shoot the Iraqi,” others would try to turn the gun away. When both of Bilal’s lamps were destroyed by paintball fire, a local Marine purchased a replacement for Bilal and brought it to the gallery. Read Orit Gat's interview with Bilal on the Rhizome blog. 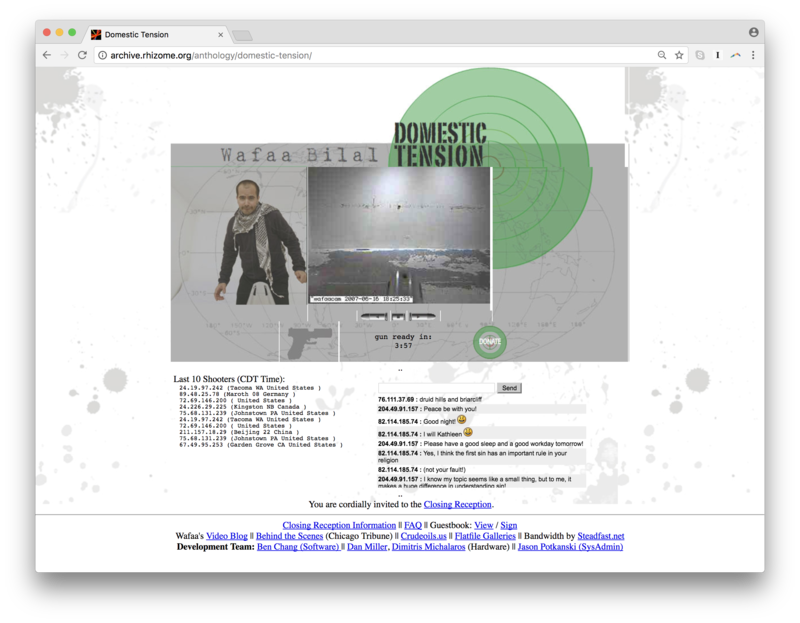 The gun was set to have a short delay between rounds, but an online visitor logging in from an IP address at MIT figured out how to make it fire on repeat, blowing a hole through Bilal’s plexiglass screen. While the online project had a gamelike quality, visitors to the gallery had a visceral experience of its brutality: the barrage of gunfire and the fumes from the slimy paint led many to describe it as a war zone. In this adversarial environment, Bilal suffered significant mental and physical distress, unearthing PTSD-related symptoms from his upbringing in Iraq and later experiences in a Saudi refugee camp. An account of Bilal’s experiences under the gun were later published in his book Shoot an Iraqi. “Domestic Tension” was created with the help of technical team Ben Chang, Daniel Miller, and Dimitris Michalaros.